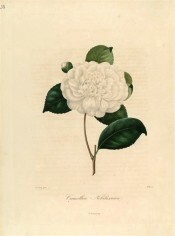 A cultivar of Camellia japonica L. ‘Leaves two and a half inches wide and three inches and eight lines long, roundish oval, a little acute, much dentated, and of a beautiful green, bud oval, obtuse, scales yellowish; flowers large, three inches in diameter, full white, exterior petals large, numerous and recurved; those of the interior smaller, crowded, rumpled; in appearance like the Pomponia. –Superb.’ [Berlèse Monography p.49/1838]. Probably raised by Lefevre in Belgium about 1832. Berlèse gives the date as 1834 [Berlèse Monography p.96/1838]. Very similar to, and possibly synonymous with the cultivar introduced from Japan by Von Siebold in 1829-30, now known as ‘Fujiyama’. [ICR]. FC. p.267/1837. Berlèse Iconographie vol.I pl.31/1841. 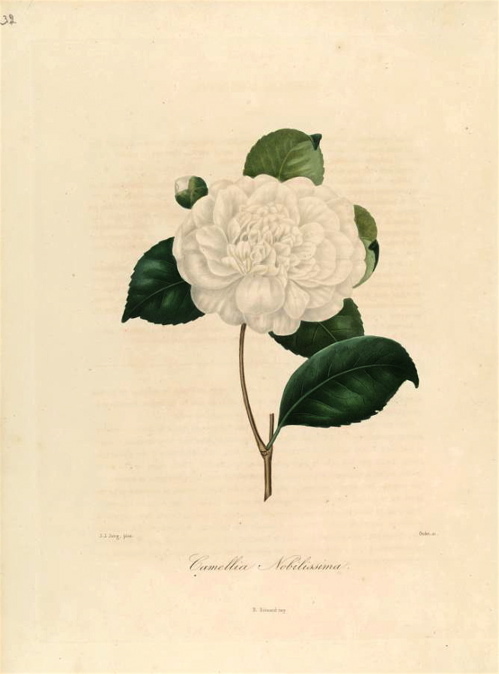 ‘Nobilissima’ was listed in the 1850 catalogue but not in 1857 and was among the camellias positively identified at Camden Park by Walter Hazlewood, although with some reservations, in the 1930’s. He described it then as small white, 5 rows of outer petals, centre composed of stamens and petaloids’. [TJSC].